Shrubs, 100-200(-400) cm (leafy, much branched, not broomlike). Stems erect to ascending, slender, striate, glabrous, resinous. 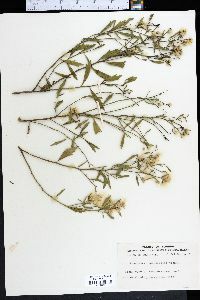 Leaves present at flowering; sessile ; blades (1-nerved) 20-60 × 1-2(-5) mm, ± succulent, bases narrowly attenuate , margins mostly entire, apices acute, faces glabrous, not gland-dotted. Heads (in groups of 3-5 near branch tips) in broad paniculiform arrays (of 100+). Involucres campanulate; staminate 3-4 mm, pistillate 3.5-5 mm. Phyllaries ovate to lanceolate, 1-4 mm, margins scarious, medians green, sometimes purplish, apices green to purplish, obtuse to acute. Staminate florets 15-20; corollas 2.5 mm. Pistillate florets 15-20; corollas ca. 3 mm. Cypselae 1-2 mm, 10-nerved, glabrous; pappi 6-8 mm. Flowering Sep-Nov. Coastal salt marshes, hammocks, dune hollows, stream banks; 0-20 m; Ala., Fla., Ga., La., Miss., N.C., S.C. Baccharis angustifolia is most commonly found in brackish, marshy areas near the coast of Atlantic and Gulf coastal plains. It is easily recognized by its 1-nerved, relatively narrow and fleshy, entire leaves, and the more or less pyramidal arrays of relatively small heads. Rarely, some specimens have slightly broader leaves with an occasional tooth, perhaps due to introgression with B. halimifolia.